Rabbit anti Bovine, Canine, Equine, Guinea Pig, Human, Mouse, Rat C20orf195. 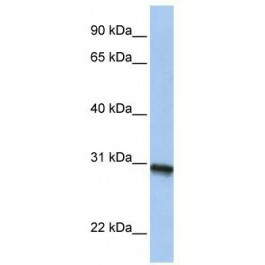 The immunogen for Anti-C20orf195 Antibody: synthetic peptide directed towards the N terminal of human C20orf195. Synthetic peptide located within the following region: RMKKVGTAQTKIQLLLLGDLLEQLDHGRAELDALLRSPDPRPFLADWALV. The exact function of C20orf195 remains unknown.